I would rather think of myself as someone leaving a snail's trail in the moonlight than someone sitting and consciously making an art. One of the most influential experimental filmmakers, Stan Brakhage created inspiring cinematic works for over fifty years. In those decades he explored non-narrative shorts, documentary, silent works and even scratching and painting his visions directly onto film stock. 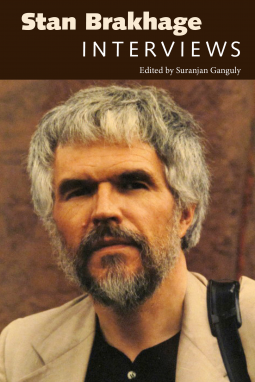 In a new book the scope of that work is revealed in a collection of eight interviews with Brakhage which span his career. Brakhage literally had a unusual vision of the world because he had a visual impairment, and one which he sometimes ignored, stumbling through the world without the glasses that sharpened his focus. He spent much of his career attempting to translate that perspective, in addition to the other ways of seeing he experienced, to film, something he speaks about frequently in these interviews. In crafting that vision, Brakhage worked to present a true view of his world, attempting to avoid creating works that were more decorative than meaningful. He was especially fixated on the process of making films that showed the pattern of colors and light that he saw with his eyes closed. By showing different kinds of vision like these, he would in essence communicate a fuller view of his life experience. After having watched many of Brakhage's films over the years, it was fascinating to get a look at his process and what he intended to communicate with his various works. He was a fluid filmmaker, exploring many different ways of approaching his art, but there's always a core theme of obsession with detail and the process of finding beauty in ugliness as a way to accept the painful elements of life. A frustrated poet and visual artist, once Brakhage knew film was his calling, he tried to tap into what only that medium could offer. He rejected narrative and, for the most part, music to explore what he could do with a purely visual, moving form. In rejecting these conventions, the filmmaker was able to free himself to a more straightforward, pure message and it was fascinating to read about his perspective on something as simple as the way light affects the way an object appears. On occasion Brakhage would also push against the conventions of interview. At one point he challenges an interviewer who tries to recenter the conversation by saying "we're getting off on a series of abstractions." Those abstractions were at the center of existence for him and the most important things to explore. It was also interesting to read about the different ways Brakhage's wives influenced his work. He was married to Jane Brakhage for thirty years, and her vision, contributions to the conception of his work, filming and editing were all key to the films he made in their years together. She was also his frequent subject, something which she allowed, but ultimately struggled to fully accept. In contrast, Brakhage's wife Marilyn Jull, who was with him for the last decade-and-a-half of his life refused to be his subject, changing once again his perception of his work, while also giving him guidance as to where to set his focus. Overall the book was an interesting journey, one that might be mysterious to those unfamiliar with Stan Brakhage's work, but an important work for anyone interested in filmmaking.